When I held my firstborn son for the first time nearly 14 years ago, my thoughts were completely in that moment. I wasn’t thinking about what he could grow up to become; rather, I was completely consumed by his 10 perfect fingers and toes, his stick-straight golden hair, and how tiny he was. I was so wrapped up in the moment that I didn’t think about how his future would be—what school he would go to, what he would enjoy, or if he would be well liked and popular or picked on. At that point in time, he was just my perfect baby. As he has grown, so has our family. We now have four children, and he and his little brother are both school-aged. We are a military family, and the kids have attended both public and private schools as we have moved all around the East Coast. Academically, my children have done well and are consistently on the honor roll. Socially, however, my younger son has struggled because he has attention deficit hyperactivity disorder, or ADHD; anxiety; and autism. With each new move, we have come to accept that we won’t just be dealing with new schools and teachers—we will be dealing with new bullies as well, mainly because my son doesn’t always know how to communicate effectively or often misjudges a social situation, such as when classmates are joking with him. Considering that we’ve been to three new schools and neighborhoods in the past five years, we’ve got this down—and you will, too! We never talk smack about the bully at home. One of the most important things you can do at home is resist the urge to put down the bully by calling him or her “bad” or any other negative name in the presence of your child. Yes, we know the bully’s behavior is obviously not ideal, but the desired outcome is for the bullying to stop, and allowing this kind of negativity will throw fuel on the fire. We encourage kindness. Whenever a child is being mean to one of ours, we tell our children that they should still try their best to be kind because those who are being mean are often the people who need the most love and kindness shown to them. We have talked about how often people have things going on in their lives that we can’t see and how those things could influence their personalities or make them less kind to others, whether it be a medical condition, an unstable home environment, or even some kind of abuse. We aren’t afraid to talk to parents and teachers. This one can be a rough one because you don’t want to jump the gun or make the bullying situation worse for your child. However, when the situation calls for it, we’re not afraid to step in and take care of business when needed to keep one of our children safe. We have asked our children’s school to be aware of the situation and help prevent incidents, which is usually as simple as keeping the children separated. We have also talked to parents and have asked them to help us keep our children separated outside when an adult is not present. Our sons are old enough to play outside solo, so we make it clear to them that they are allowed to play with the child in question only when we are there. We do not tell them that they cannot play with the other child because that child is bad but explain that they would play better together with an adult present. By not outlawing play altogether, it also makes playing with that child less attractive, which is helpful in cases where your child wants to win the approval of the bully. Don’t be afraid to protect your child—by any means possible. If the bullying persisted after talking to the parents and/or the school, I wouldn’t be afraid to take more drastic actions, and you shouldn’t, either. 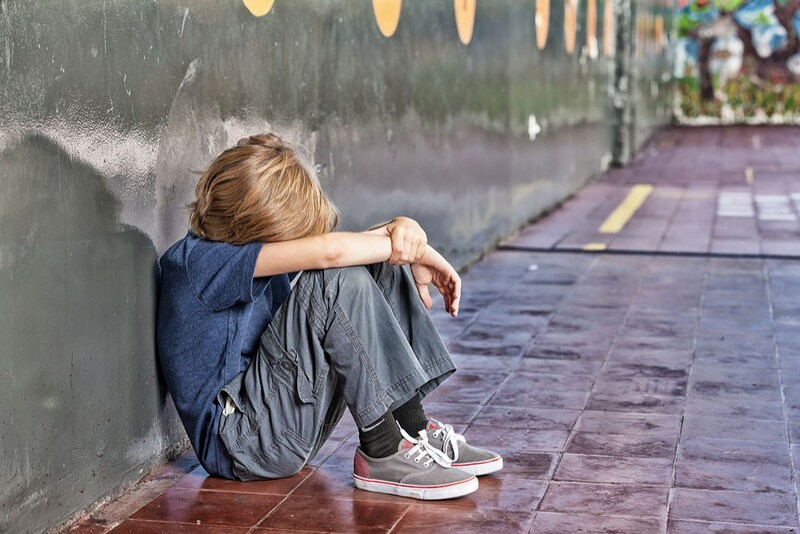 Whether or not your child is in private school, if you’re in the midst of a bullying problem at school, you are paying (by way of taxes or tuition) to send your child to a place where he or she is not happy, and eight hours a day is too long to be unhappy and on edge, in my opinion. You wouldn’t stay at a job where you were being bullied and unhappy if you didn’t have to, and if the situation is that dire, your child shouldn’t have to, either. Thankfully, for those of us without the means to just pull our children from school, often the threat of doing so will get the administration’s attention enough to take more drastic actions to relieve the problem. Another way you may have to protect your child is through pressing charges and/or filing a police report. Depending on the age of the child or how badly your child was assaulted, you may need to make the difficult decision to escalate the matter further. When you do this, make sure you know what you want the end result to be, discuss that with the police officers, and ask them what they recommend—they deal with this day in and out and can tell you what to expect if you proceed to press charges versus filing a police report in your area, as laws vary from state to state. These are all steps that I have taken with my own kids when it comes to bullying. I didn’t like having to get the school or authorities involved, but they were understanding when they realized that my end goal was to simply have the bullying stop, and they worked with the parents and the child to ensure that happened. In one case, I have even seen one of my sons develop a friendship with a bully after the school administration and their teacher worked together to help them realize that they weren’t so different after all (and both loving Pokémon didn’t hurt!). Be sure to check out our Community of Sisters to connect with other moms with similar experiences.